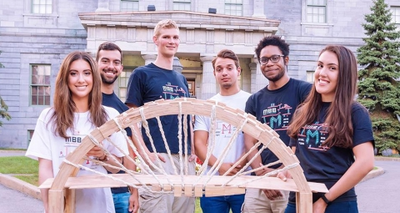 The McGill Bridge Building Team is an engineering design team that centers on designing and building bridges in either wood or steel for multiple engineering competitions. We welcome undergraduate students from diverse backgrounds to join us in managing exciting challenges through unique solutions. Our holistic mission is to provide our team members with practical, hands-on design experience to strengthen their understanding of in-class concepts, and foster creativity. So far, we’ve built a total of 14 wooden and 2 steel bridges. On Wood Team, we build smaller scale, design-oriented projects using only popsicle sticks, glue, and dental floss. We always promote using new techniques and improvements towards building innovative bridges. There are some constraints to follow: typically, bridges are 1.20 to 1.35 meters long, up to 600 millimeters tall, and up to 350 millimeters wide, although dimensional specifications set for the competition are subject to changing slightly each year. The main project phases include design of the bridge structure, trimming the sticks, building sheets of plywood, sawing, and drilling, suspension preparation, and assembly practice. 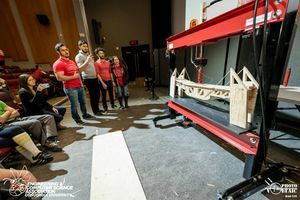 The Canadian Society for Civil Engineering (CSCE) Troitsky Bridge Building Competition gives teams of engineering undergraduates a chance to design and build bridges and compete against universities from all across Canada. The final bridges are judged based on aesthetics and design originality, predicted ultimate load and mode of failure, actual ultimate load, efficiency (ultimate load/weight of the bridge), team spirit, oral presentation and booth design. The steel bridges we build are roughly 19 to 21-feet long. Many dimensional constraints and assembly guidelines apply to the bridge’s design and assembly strategy, though these are only revealed in the competition mailers once teams are registered. One such example was a river flowing through the center of the construction site, forcing teams to assemble their bridges on either side of the river and having both ends meet in the middle. Once assembled, the bridges are then loaded with a specified loading pattern both laterally and vertically, and deflections are recorded at various locations along the span to determine the bridge’s efficiency. A highly complex undertaking, we have overcome adversity to compete the last two years. In the 2017-2018 season, our team is excited to learn from our past and create our best steel bridge yet! 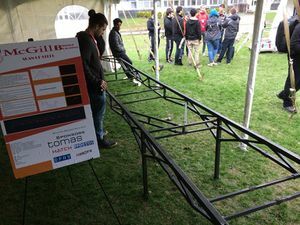 The Canadian National Steel Bridge Competition is a newly created competition, where universities from all over Canada compete by attempting to build efficient steel bridges. The final bridges are ranked on multiple criteria, including speed of assembly, architectural design, weight, and deflection. The Team Captains are responsible for overseeing each and every project the bridge team is undertaking, set objectives and deadlines (along with the co-captains), and must work to ensure that each sub-team has all the resources needed to meet them. This page was last edited on 30 October 2018, at 16:40.